Chicken Mole is one of the most popular recipes in our filebox. It was one of the first recipes I ever posted in this blog (way back in December 2006), but it was buried at the end of my Seven Ways to Get Faster at Cooking post. Although that turned out to be one of the most heavily viewed posts in this blog, the recipe itself was almost an afterthought, lost at the bottom of the page. 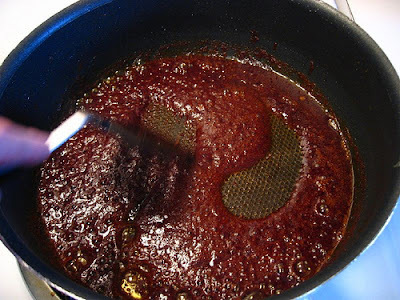 So today I'm going to expand on my mole sauce recipe by giving it its own standalone post, and by adding several new photographs that will show, in detail, all of the process steps in making the recipe. Hopefully this will assist you in mastering this exotic and surprisingly easy to make dish. Let me start with two brief points of trivia: 1) It's pronounced "MOH-lay" and 2) The secret ingredient is of course chocolate. I've never known anybody to figure it out just from tasting the sauce, unless they already knew what a mole sauce was. This recipe is one of the heavy rotation mainstays in our kitchen. It can be made vegetarian-style with only minor adjustments. It is easily scaleable (I’ve cooked it for 27 people at a family reunion), freezable and reheatable, and it can be made from start to finish in about half an hour. I hope that you find this dish as fun to cook and eat as we do. 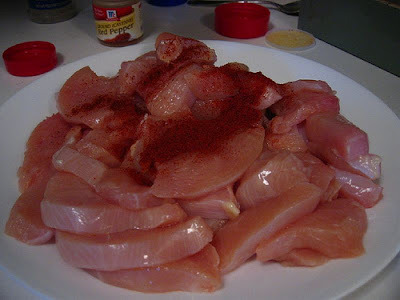 1) Season raw chicken with cayenne pepper and coarse ground black pepper. Heat a few tablespoons of olive on high heat in a large, deep (4 quart) nonstick pan. Add chicken and sear at high heat until just done (do not overcook!). Set chicken aside. 2) Reduce heat to medium-high and add a few more tablespoons of olive oil to pan. Shake spice mix into the olive oil and stir with a plastic spatula. 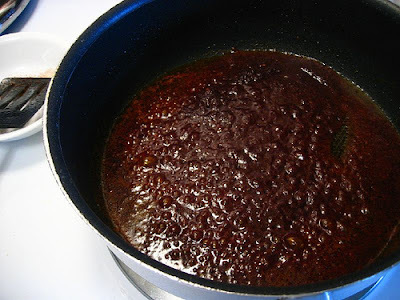 Add more oil (if needed) until all of the spice mix is moistened in the oil. 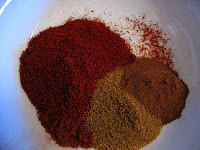 Heat spices until they are blackened and smoking, about 6-7 minutes or more (be sure to have your overhead fan on for this part!). 3) Lower heat to low and add unsweetened chocolate. As the chocolate is melting, stir it into the blackened spices with a spatula. When the chocolate is fully melted, add in the stewed tomatoes. Bring to a boil and simmer over medium heat for 10 minutes, stirring occasionally. 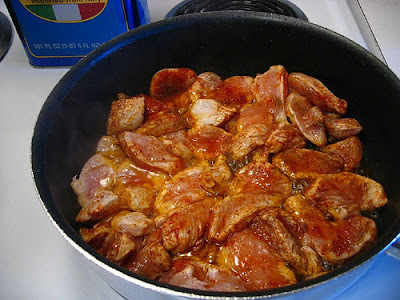 Add the cooked chicken into the sauce and simmer for 5 more minutes. Serve over white rice. Serves 5-6. Let's take a detailed look at a series of photos that will help you see how the dish gets made. This section of today's post will be a bit long, but I'm going to err on the side of including more detail rather than less because the visuals are fairly important for this recipe. 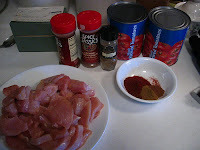 Be sure to mush the chicken pieces around in the spices so that they are liberally covered on all sides. 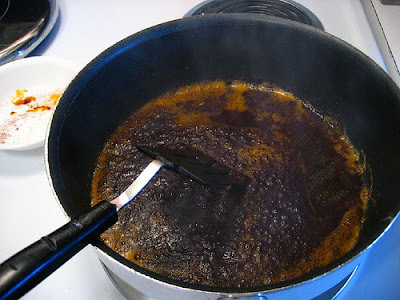 Set the chicken aside, but leave the oil and liquid in the pan. Note: If you want to make a vegetarian version of this dish, just skip the chicken cooking part and just add five or six tablespoons of straight olive oil to the pan and proceed to the next step. ... and stir them around until they are mixed in with the oil in the pan. Feel free to add more olive oil such that the spice mixture is totally moistened. ...and then turn almost black and start smoking. If you have an overly sensitive smoke detector in your home, consider disconnecting it temporarily. If it's the first time you're making this recipe, I know it may seem like you burned the spice mixture (which you did) and therefore irreparably ruined everything (which you did not). 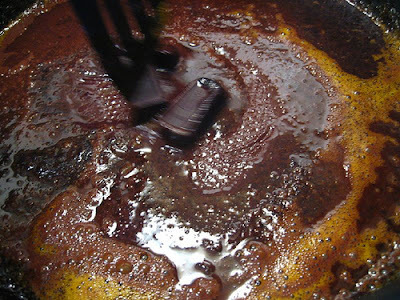 It is precisely this part of the process that infuses the mole sauce with its signature smoky, sweet taste. 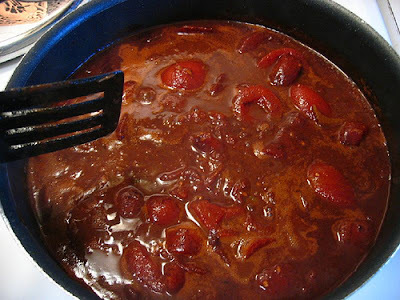 Once the chocolate is fully melted, add the stewed tomatoes, return the heat to medium-high, and bring to a boil. The rest of the recipe is pretty self-explanatory after that. Que Bueno, Senor CK. I have always wondered exactly how to make this dish. I once had chicken mole at a dingy joint years ago in Austin Texas and it blew me away. It's been nothing but disapointment since then - sickly sweet sauces, bland canned crap or a first taste thats a harbinger of Hershey-flavored doom. Can I jack up the chili a bit? I once read something (positive?) is triggered in the pre-frontal cortex when you combine bitter chocolate and hot chilis. I am going to make this immediately for my pregnant wife and will give CK all due credit. You certainly can jack up the chili as much as you'd like. We'll spike both the chicken and the spices-in-oil mixture with cayenne, but you can also try other peppers, like Tabasco or ground chipotle pepper if you'd like. I'd be curious how it comes out! Oh my gosh, that looks so good!!! I've only had mole sauce once or twice but now you've given me a huge craving! I'm always excited when somebody reads one of my posts and gets a craving... it means I did my job well as a blogger. Thanks for reading!! It's also delicious with cashews added to the sauce. Serve the chicken with rice, beans, and pickled carrots - I had this in Mexico this way - it was outstanding! Looks great, glad to have come across this on Twitter. Will have to try soon. Adding to my Delicious tags. I think I actually did pick up the chocolate in mole w/o knowing it's ingredients, but I could be mis-remembering! You were so right, I did think I'd burned the spices when they went black - thanks for adding the photos, it saved me feeling like an idiot and tossing the whole lot out. turned out delicious in the end, I'm not a hot food fan so I realy toned down the chili factor. 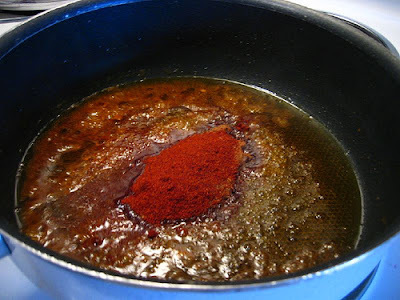 Excellent walkthrough for a textbook mole sauce. I will offer some professional tips that will assist in making this dish as incredible as humanly possible. 1. As far as chili powder goes, there are a hundred different brands that can be found with mixed results. I highly recommend using Mexene brand, and only chili powder in any application, though slightly more expensive, the finished result is well worth it. 2. If truly adventurous, go to your local Hispanic grocery and buy dried chilies and make your own. You can buy a pound of most dried peppers for a couple of bucks each that will never go bad, and can be used in so many other applications. I usually use a blend of Ancho, Pasilla, Guajillo, and Mulato peppers, in fairly equal proportions, with a couple of dried Cayennes in there for some heat. Break the peppers apart, remove the seeds, and then put them in a spice or espresso grinder. There is nothing better than a fresh chili blend. I love it Stuart, thanks for the feedback and ideas. Great input. I was actually a little disappointed in this (which I think is the first time I've ever said that about a recipe I've made from your blog). I've had mole before and loved it, but this was a little bland. It was spicy enough, but had no flavor or complexity before the spice. Maybe I overburnt the spices? There were little charred flakes, not a good smokey undertone. (I even bought good quality 100% cacao unsweetened chocolate.) I ended up adding extra cumin, cinnamon, and a decent amount of garlic powder (as well as some salt...Stop judging me.). On rice, it was decent, but not great. I'm going to give it one more attempt (enough chocolate for another batch), but it may be a loss for me. I so want to try this but I don't know if I have the chutzpah to "burn" the spices! I've done that accidentally before and the results were not pretty. Did you add a liquid to the spice mixture before adding the chocolate? It looks runnier than the previous picture. I would worry that the chocolate would seize up if it was tossed directly into such a hot pan. Clearly it works for you though. I will screw up the courage to try this sometime. The Sieve was lucky he found that place in Austin. I may have found it too on the east side of Austin. Then I was lucky enough to have another major find in Seguin, Texas (south side). Apparently the great gods of cuisine have been smiling on me. I made this last night and was very disappointed. I followed the recipe almost exactly (added some garlic), and it was bland...the flavor that was there wasn't very good either. My husband, being the good sport that he is, offered to eat some of the leftovers for lunch, but other than that, I doubt it will get eaten. Thanks for the effort though! Sorry to hear you didn't like the result. I will say, however, that you are one of very few people I know (Brittany, above, is one other) who didn't like this recipe. It's entirely possible that a mole sauce just isn't to your liking--nothing wrong with that. Either way, I'm grateful for the feedback. Very nice...one question, though. Are you supposed to drain the liquid from the stewed tomatoes? I did not, and I thought it was good, but had a lot of liquid. Either way though it was great...thanks!!! P.s. the braised pork in guajillo chili sauce was ridiculously awesome!!! Joshua, you did it right--don't drain the liquid from the stewed tomatoes. The sauce is supposed to be slightly thick but still liquid. Glad you enjoyed it and thanks for the feedback! I made this for dinner tonight and it was great! Thank you for the presentation... If I want to delete the stewed tomatoes from the recipe what would happen? Or do I need to substitute with another liquid? What would you recommend? You could possibly substitute cans of diced tomatoes or crushed tomatoes in the identical amount (in other words, 4 14.5-ounce cans). It would yield about the same amount of liquid and the same thickness. Let me know if that works for you. How do you use a mole sauce once it's cooked? Eat it straight or pair with something? Our favorite way to eat it is served over simple white rice. I had the identical - IDENTICAL experience and associated longing, unrequited for a dozen years now. 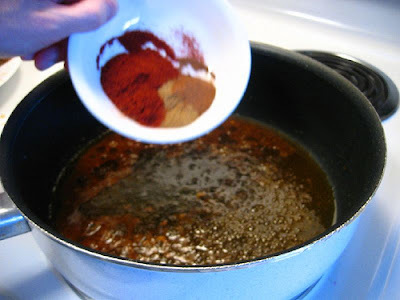 I made turkey chili the other day and the smokiness of something led me to that thought..."mole"...and to this blog. WONDERFUL. Turkey is a kind of rank thing. Chocolate makes it something the kids couldn't get enough of...and I didn't enlighten them as to why. If you find this recipe too bland and you're after a smoky flavor, try adding a teaspoon of smoked paprika. Anonymous, I think that's a really creative idea to use it as a marinade. If you try it, would you mind letting us all know how it came out? Thinking of making this using ground venison and black beans for a church chili cook off next month. Any advice? I love the blog and will start following you! Hi Colleen! You've got a really interesting idea for a variation, and it sounds like it could work really well. Let me know how it comes out!!! G’day! Thank you for inspiring me! This recipe is as OLE as can be! A slightly adapted recipe I did make, TRUE! Here’s the link, should you wish to view! My sauce is stewing on the stove, and it unfortunately tastes like I added something burnt to tomatoes, which is exactly what the recipe calls for. I'm thinking if I try this again, I would just get the spice mix heated to open up the flavors, but not let them cross over into burnt territory. Maybe I'm using cheap spices or something? Hi Jennifer, the recipe is supposed to taste smoky, but I wouldn't describe the flavor as burnt. So yes, maybe you heated the spices for a bit too long. Good luck! I've made this dish several times, and absolutely love it. Serving this with beans over white rice or -- better yet -- wrapped in soft flour tortillas, topped with cheese or sour cream... it's perfection. Thank you! Really appreciate the feedback. I'm grateful!